We’d love your help. Let us know what’s wrong with this preview of Weather Proverbs by George D. Freier. Have fun with over 600 weather proverbs, poems and sayings. Learn the scientific facts behind them. Meteorology explained. To ask other readers questions about Weather Proverbs, please sign up. I legitimately thought I might never finish this book. It was the weirdest thing: when discussing weather proverbs, Dr. Freier was an engaging and interesting writer who pulled me along eagerly. 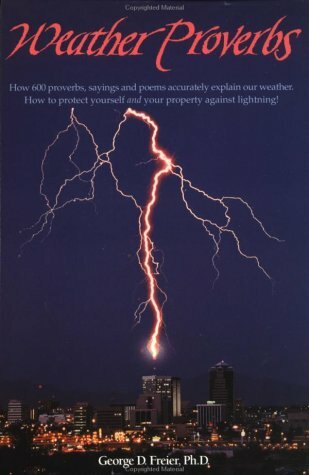 Once he got into the meteorological section, explaining the scientific phenomena that underpinned the proverbs, the writing got soooo dry and boring (and oddly obsessed with lightning) that I could barely slog through. But I've been struggling with insomnia lately, and this book happened to be on my nigh I legitimately thought I might never finish this book. It was the weirdest thing: when discussing weather proverbs, Dr. Freier was an engaging and interesting writer who pulled me along eagerly. Once he got into the meteorological section, explaining the scientific phenomena that underpinned the proverbs, the writing got soooo dry and boring (and oddly obsessed with lightning) that I could barely slog through. But I've been struggling with insomnia lately, and this book happened to be on my nightstand. Turns out that about 10 pages of the end of this helped me fall asleep faster than just about anything.